HAVING been in business for nine years, the owners of Fusion Haven Cafe and Restaurant?s spirit is still high when it comes to flexing their creative muscles. The men behind Fusion Haven Cafe and Restaurant are from the advertising industry who are ?scared of boring stuff?. As such, the backbone of their restaurant is an exclusive menu created from fusing various cuisines, particularly Italian and Japanese. Such creativity has drawn in many like-minded diners who are there not just for the tasty offerings, but also a sense of adventure as the dishes lead them on an escapade of flavours. It is time to offer something refreshing again, according to restaurant partner Danny Loke, hence the menu revamp. Some 70% of the dishes are new with pizza, western dishes, ramen and spaghetti added in while the all-time favourites remained. 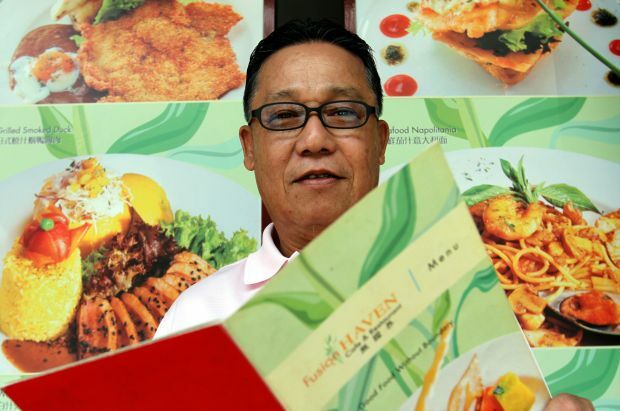 Loke said they spent about one month designing the menu. It was considered a short period as they knew what ingredients paired well together. ?I make notes constantly through the years. Customers? feedback, cooking tips and little discoveries when trying out new dishes, are all incorporated into our latest batch of creations. Heart?s content: Jamaica Cheesy Chicken Ricefor a hearty meal. ?The ideas come from everywhere, any cuisine, and that explains our tagline ?Good food without boundaries?. ?Nevertheless, we have geared our focus towards Italian and Japanese cuisines because we have lived there briefly and love the food,? he added. To kickstart the new food ride, we tucked into the Kara Age Soft Shell Crab Instalata, a salad with Japanese and French influence. It was made with Takuan (Japanese pickled radish) and jazzed up with a dash of homemade French dressing and sliced Parmesan. The salad was tangy with a hint of spiciness. In between: Smoked Duck Pomodora Alfredoblends together with cream and tomato sauces. The pizzas, a new attempt by the chef, came in four choices. The thin crust was enhanced with black bamboo charcoal known for its health benefits, while a generous amount of ingredients were sprinkled atop a thick layer of cheese. Salciccia and Pepperoni were the recommended flavours. 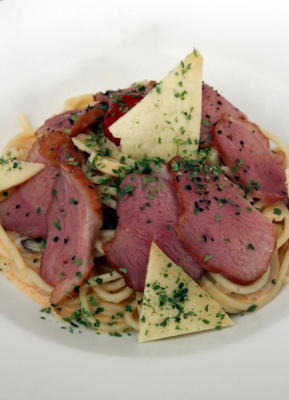 Smoked Duck Pomodora Alfredo looked appealing with the special pink sauce made from mixing tomato and cream. The concoction was further sizzled up with a dash of wine. Rice lovers could opt for Jamaica Cheesy Chicken Rice or Kiji Joji Curry Pork Chop Rice, both served with rich sauces and thoroughly marinated meat. Fusion Mango Instalata, Fusion Omelette Rice and California Unagi Rice Noodle Roll (chee cheong fun and seaweed) were some of the perennial favourites kept in the new menu. Also included in the new menu was the Ipoh-inspired Caramel Pudding. ?I was told about this pudding in Ipoh and tried to make it with my chef. Some customers commented that ours taste very similar to the Ipoh version,? said Loke with a smile.